CASA CAROLINA - located in Sebastopol, California - is a delightful vacation rental located in the heart of the Sonoma County Wine Country. Specifically we're in the Russian River Appellation, one of the wine regions nearest the Golden Gate. 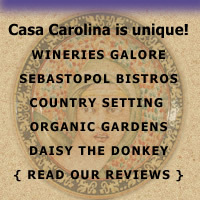 The Casa is only two miles from downtown Sebastopol with it's awarded bistros and variety of shops. In a 20 minute drive you'll find the Pacific Coast and beautiful beach trails.